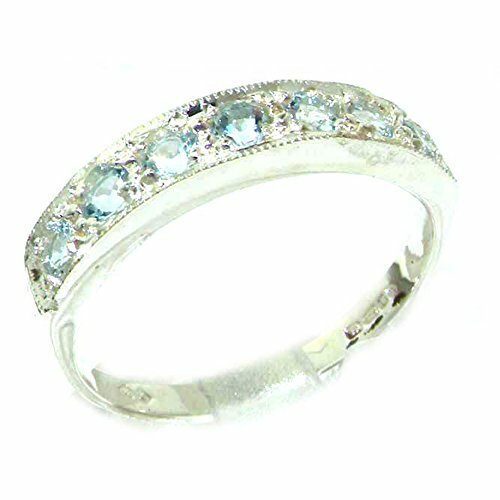 This Delightful Eternity ring has been set with seven brilliant cut Natural Ice Blue AquamarinesThis ring is ideal as an eternity ring as it can easily be worn on the same finger as an existing wedding ring (being 4mm wide) and the stones are set very securely with the setting being protected by the slightly raised edge.HIGH QUALITY NICKLE FREE ENGLISH SILVER On the inside of the shank there is a Full British Hallmark which includes 925, the Leopards head and the Royal Lion, only High Quality Silver articles will have a Full marking such as this. All Genuine Natural Aquamarines. If you have any questions about this product by LetsBuySilver, contact us by completing and submitting the form below. If you are looking for a specif part number, please include it with your message.